Okay, okay… I know I look pretty ratchet in these photos, but I’d hate to waste a cute outfit just because I was having a bad hair and makeup day! It was pouring rain the day we left Tokyo for Kyoto, so naturally my hair was uncontrollably frizzy and my makeup didn’t stay put. But my outfit was on point for the travel day – comfortable, easy and chic. As you guys have heard me say before, I never ever travel without a trench. It’s an effortless and classic silhouette, adds an extra layer if you’re chilly, and instantly ties together nearly any kind of outfit! Most of my trenches are from Club Monaco, and this one is no exception. I actually already have this exact trench in blue, but saw they came out with it in this pretty stone grey color (which I knew I had to try)! I also ordered this white trench, but felt like the stone grey might be more useful – also, the white just sort of made me feel like a doctor in a lab coat… but I digress. It was the ideal extra layer for that rainy, chilly morning and perfect over my new cotton-voile cami. I have this cami in silk and velvet, but saw they came out with it in this new cotton-voile fabric that looks a touch more casual. I love that! It’s perfect for days like this when silk feels a little too formal. 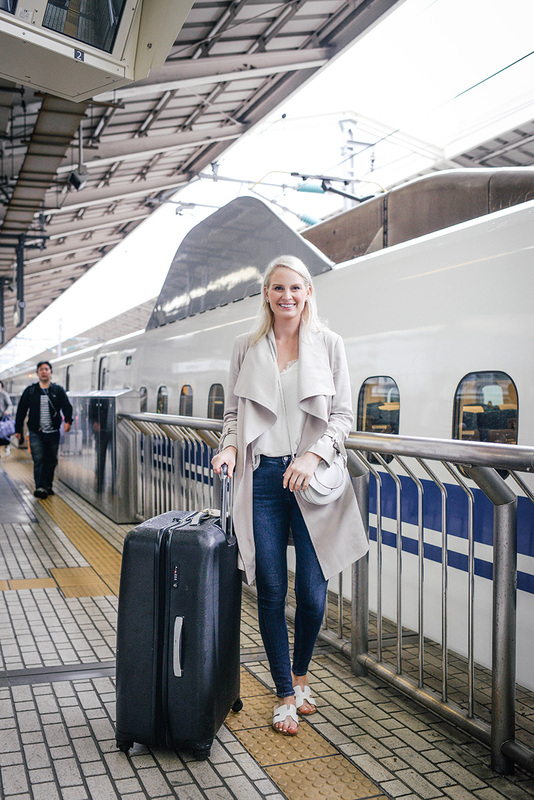 PS: if you don’t know what a Shinkansen is, you can read more about it here in my “Important Things To Know Before Traveling To Japan” blog post! I don’t think you look ratchet at all. OMG I wished I looked that on a normal day haha! I love how your trench coat drapes. It’s so flattering and chic! I love that trench! 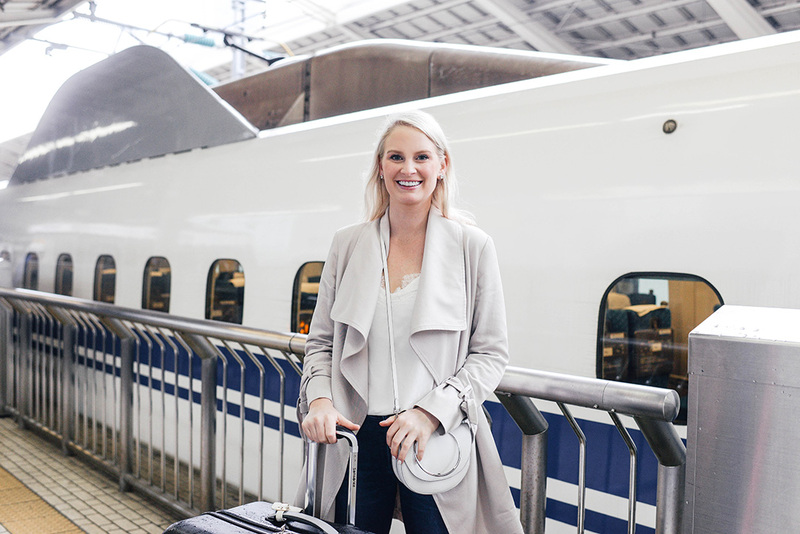 You look amazing – I can never pull off the cute travel look, I’m so impressed!